Her married name was Cropper. Minnie Payne was born circa 1921. She married John Cropper. John Cropper was born on 18 March 1918. He married Minnie Payne, daughter of Herbert John Payne and Emily Chaulk. John Cropper died in 2000 at Newton le Willows, Lancashire. Catherine Cropper was born on 29 June 1950. David Cropper was born on 30 May 1953. Leslie Owen married Ethel Payne, daughter of Herbert John Payne and Emily Chaulk. Ivor Richardson married (?) (?). Her married name was Shepherd. Doris Richardson was born circa 1916. She married Edward Frank Shepherd. Doris Richardson died on 12 November 1993. She was buried after 12 November 1993 at Parish Church, Haseley, Oxfordshire. Edward Frank Shepherd was born circa 1916. He married Doris Richardson, daughter of (?) Richardson and Mary (Polly) Chaulk. Edward Frank Shepherd died on 14 May 1989. He was buried after 14 May 1989 at Parish Church, Haseley, Oxfordshire. Ethel Stockton married Frederick Hardman, son of John F. Hardman and Eleanor Davies. Her married name was Hardman. Annie (?) married James Hardman, son of John F. Hardman and Eleanor Davies. Annie (?) was born at Widnes?, Lancashire. Her married name was Hardman. John Black was born circa 1843 at Fife, Scotland. He married Elizabeth Dearden. John Black appeared on the 1881 Census in 30 Fenneys Lane, Sutton, St Helens, Lancashire, and Elizabeth Dearden, William Black, Margaret Black, George Black and Mary Ann Black were living in the same household; John the head was a loco driver. It appears that Fenneys Lane was previously known as Mount Pleasant. John Black appeared on the 1891 Census in, St Helens, Lancashire, , and Elizabeth Dearden, William Black, Margaret Black, George Black, Mary Ann Black and Annie May Black were living in the same household; John the head was described as a railway engine driver, William a clerk, Margaret a dressmaker, George an apprentice fitter. John Black appeared on the 1901 Census in, St Helens, Lancashire, , and Elizabeth Dearden, George Black, Annie May Black, Elizabeth Black and Mary Ann Black were living in the same household; John the head was a railway engine driver, William was a railway clerk, George a steam engine maker turner, Mary and Annie were assistant school mistresses. Her married name was Black. Elizabeth Dearden was born circa 1844 at, St Helens, Lancashire, . She married John Black, son of George Black. Elizabeth Dearden appeared on the 1881 Census in 30 Fenneys Lane, Sutton, St Helens, Lancashire, and John Black, William Black, Margaret Black, George Black and Mary Ann Black were living in the same household; John the head was a loco driver. It appears that Fenneys Lane was previously known as Mount Pleasant. Elizabeth Dearden appeared on the 1891 Census in, St Helens, Lancashire, , and John Black, William Black, Margaret Black, George Black, Mary Ann Black and Annie May Black were living in the same household; John the head was described as a railway engine driver, William a clerk, Margaret a dressmaker, George an apprentice fitter. Elizabeth Dearden appeared on the 1901 Census in, St Helens, Lancashire, , and John Black, George Black, Annie May Black, Elizabeth Black and Mary Ann Black were living in the same household; John the head was a railway engine driver, William was a railway clerk, George a steam engine maker turner, Mary and Annie were assistant school mistresses. 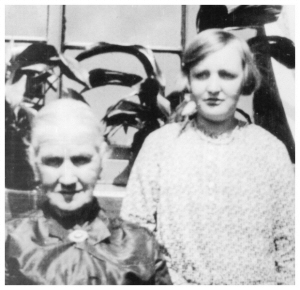 Old Ma Black as she was known is pictured with Elsie Parsonage beside the back window at 6 Station Road. The picture is dated around 1930 when Elsie was 13 years old. Elizabeth Dearden died in 1933. Marriage* She married John Black, son of George Black. Richard Barrow married (?) (?). Richard Barrow was born circa 1826 at Little Bolton. He appeared on the 1871 Census in 29 Watery Lane, Sutton, St Helens, Lancashire, and Ellen Barrow, Nathan? Barrow, Mary Ann Barrow and James Barrow were living in the same household; Richard the head was described as a labourer, as were the rest of the family. Richard Barrow appeared on the 1881 Census in Chancery Lane Cloggers Shop, Parr, St Helens, Lancashire, and James Barrow, Mary Ann Barrow and Richard Barrow were living in the same household; James was the head and was described as a clogger, his father Richard, a widow, was a general labourer, Mary was a housekeeper, a nephew to James was also present - Richard. Also in the household was a boarder John Hampten, a foreman shunter on the railway. 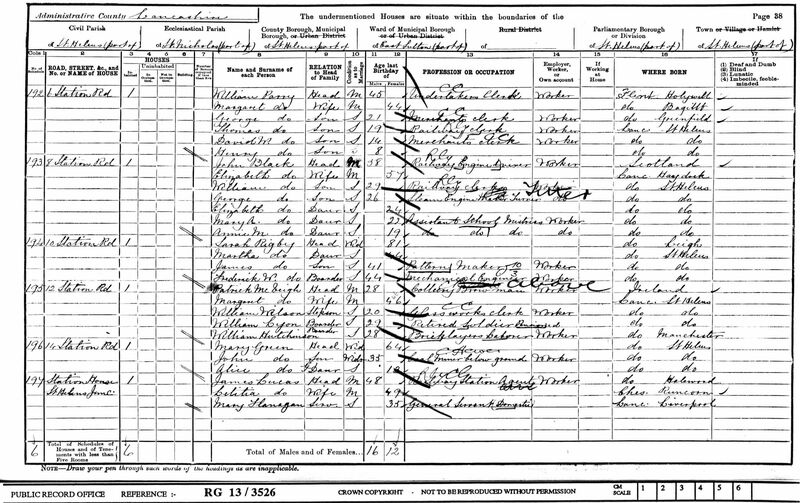 Richard Barrow appeared on the 1891 Census in, St Helens, Lancashire, , and Mary Ann Barrow, Minnie Chaulk, Emily Chaulk and Henry Chaulk were living in the same household; Henry was a Plate Glass Maker and Richard Barrow his father-in-law was a labourer at the glassworks. (?) (?) married Richard Barrow. Her married name was (?) Barrow. (?) (?) died before 1881. Jonathon Brookes was born circa 1968. David Brookes was born after 1969. He married Valerie (?) in December 1998. John Hardman died c 1930's. According to Elsie died in a motorcycle accident, also on the bike was his brother Frederick who survived. Had no children. Thomas Garard Odlum was born circa 1880 at Earlestown, Lancashire. He appeared on the 1881 Census in Vitriol Square, Newton in Makerfield, Lancashire, and James L. Odlum, Mary (? ), Alice Odlum, James L. Odlum and Humphrey O. Odlum were living in the same household; The head of the household James was described as a core maker. Also present in the household was his sister Sarah Bell visiting, and two boarders who were labourers in the wagon works, Edward Ward and Clement Tipper. Thomas Garard Odlum married Minnie Chaulk, daughter of Henry Chaulk and Mary Ann Barrow. Arnold Clarke married Janette Margaret Hardman, daughter of George Hardman and Agnes Featherstone, in December 1980 at St Helens Registry Office, Lancashire.